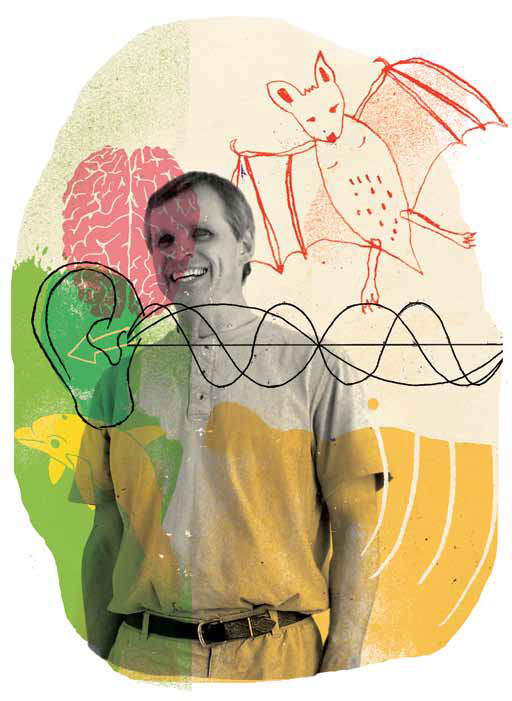 Born blind, Brian Borowski has learned to navigate the world through echolocation. Meet the scientists who are trying to figure out how. Biking along the gravel roads near his family’s farm in southwestern Ontario, Brian Borowski always paid close attention to his surroundings. Constantly turning his head back and forth, he’d note the grassy margins of the trees, the fences and passing cars. Not that accidents never happened. “I went off the road one time in a place where there wasn’t much definition,” he recalls. “Went down a little hill and almost got my ear poked out by a branch.” Not a big deal. After all, he was a farm kid. And he’d been blind since birth. Borowski is a master of echolocation. He makes sharp clicks with his tongue, then uses the echoes that bounce off nearby objects to assemble a picture of his environment—just like bats and dolphins do. Now 56, he’s been recruited for a research project led by Mel Goodale, the director of the Brain and Mind Institute at Western University (formally University of Western Ontario). Using advanced imaging techniques, Goodale and his colleagues are peering inside the brains of echolocators like Borowski to gain new insight into how much information our senses can absorb—if we simply tune into the world around us. Goodale’s secondfloor office is decorated with optical illusions—a perspective-skewing 3-D painting by British artist Patrick Hughes and a smooth, concave face that appears to jut from the wall. Goodale, who has a thick grey beard and friendly eyes, has spent four decades as a visual neuroscientist exploring how we perceive the world. “I’m a vision guy,” as he puts it. On the surface, studying the incredible aural abilities of blind echolocators seems like a radical change. But a hunch on Goodale’s part paid off: When he and his colleagues recorded the brain activity of two echolocators for the first time in 2009 they saw that the visual cortex—the area of the brain sighted people use to process visual data—lit up when the subjects heard clicking sounds with scarcely perceptible echoes. As far as their brains were concerned, they were “seeing” with their ears. The principles of echolocation are well understood. Humans, after all, have already harnessed it for sonar devices. You send a sound wave and wait for it to bounce back from an object; the longer it takes for the echo to arrive, the farther away the object. For most blind people, though, sound is used as an adjunct to more familiar aids such as white canes and guide dogs. “Only a very small population of blind or partially sighted people can navigate their surroundings primarily by echolocation,” says Len Baker, a vice-president at the Canadian National Institute for the Blind. The precise number of blind people who have developed the skill independently is unknown, but awareness is growing. The California-based organization World Access for the Blind has already trained more than 5,000 students to echolocate. “It can be so liberating and useful, but not that many people within the blind community know about it,” says Jen Milne, a graduate student at Western who is working with Goodale. In fact, Borowski remembers being discouraged from echolocating when he was a student at the Ontario School for the Blind (now the W. Ross Macdonald School) in Brantford. There was a strong sense among the instructors that “if you’re going to be out in the world, then you should really act more like sighted people,” he recalls. Of the 200 or so students at the school, only Borowski, his younger brother David and one other student used the technique, ignoring complaints from the counsellors. Both Borowski and David were born blind, likely due to a genetic condition that affected the optical nerve (Borowski has a twin who is sighted). The siblings stumbled on the idea of echolocating one evening when they were children. They were standing outside, listening to echoes ricochet off the side of the house while their father pounded metal stakes into the ground. “We thought, if we make a noise with our mouth, maybe we can use that sound,” he recalls. Over time, the brothers refined the technique, learning to make a sharp, percussive tongue click that produces a clear echo. The appropriate sound depends on context, too: In a lineup at Tim Hortons, Borowski might jingle a couple of coins together in his pocket, using the echoes to keep track of how quickly the line is moving. In some cases, when there’s too much background noise, echolocating is simply impossible. 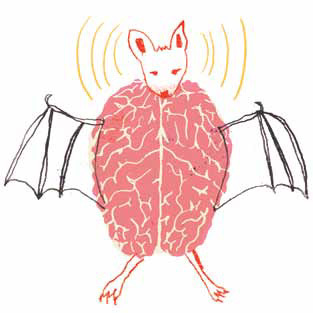 Echolocation might sound simple, but the reality is quite different. To demonstrate, Milne and Borowski took me down the hall and around the corner from Goodale’s office—Borowski clicking quietly as he led the way—to an “anechoic chamber.” This was a closet-size room with blankets on the floor and thick layers of egg-carton-shaped foam covering the walls, designed to scatter and muffle all echoes. Such a room deprives echolocators of their main source of feedback from the world around them. One person described it as being like standing in a vast prairie field; another said it felt like he was in outer space. The reason most of us don’t echolocate is that we’ve never tried. But we can learn to embrace the full capacity of our senses. Milne held up a foil-covered square to test whether Borowski could discern the shape; Borowski began making a sharp clicking sound every second or so, like someone tsk-ing in disapproval. “The edge is there?” he asked, pointing an outstretched finger at one side of the square. Bobbing his head up and down and side to side, he soon traced the perimeter of the shape to within a few centimetres, and identified it as a square—all without touching it. That was one of the surprises of the first echolocation study, which Goodale and his postdoctoral researchers Lore Thaler and Steve Arnott published in the journal PLoS One last year. Echolocating, they learned, isn’t necessarily an adaptation to blindness. True, the part of the brain echolocaters would otherwise use for vision has been rewired to process sound, but this crosslinkage is less unusual than it might seem, says Thaler, now a professor at Durham University in England. “In the brain, everything is basically connected with everything,” Thaler says, referring to the dense web of circuitry joining the brain’s major regions. Throughout our lives, connections between various parts of the brain are strengthened or weakened depending on how much we use them. It’s one reason why, in so many contexts, practice makes perfect. Taking away one sense makes the others stronger, the old cliché says. That’s not quite right, the echolocation research tells us. Our senses are already strong—we just have to listen to them.